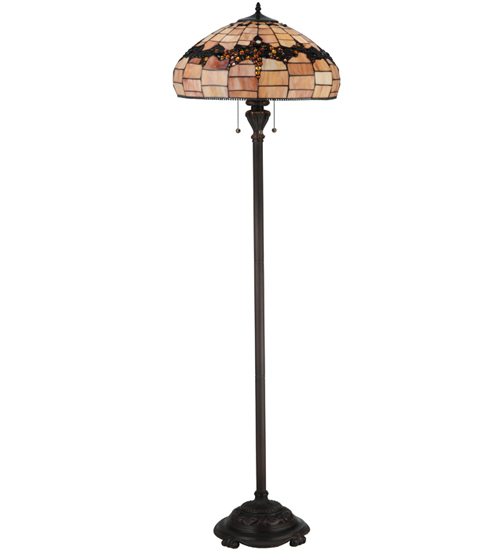 Description: Experience the beauty of the vineyard captured in stained art glass and jewels when you own this Concord lamp created by Meyda Tiffany. This luscious design incorporates Garnet Red, Golden and Amber Yellows, Amethyst, Concord Purple, Sky Blue and Clear glass jewels, as well as Multicolored pieces of art glass and small beaded bands on a Creamy Lavender swirl background, for a unique Nouveau appeal. The resplendent shade is created using Meyda?s famous copperfoil construction process and complemented by a floor base hand finished in a handsome Mahogany Bronze.